(a) Service of Involuntary Petition and Summons; Service of Petition for Recognition of Foreign Nonmain Proceeding. On the filing of an involuntary petition or a petition for recognition of a foreign nonmain proceeding, the clerk shall forthwith issue a summons for service. When an involuntary petition is filed, service shall be made on the debtor. When a petition for recognition of a foreign nonmain proceeding is filed, service shall be made on the debtor, any entity against whom provisional relief is sought under § 1519 of the Code, and on any other party as the court may direct. The summons shall be served with a copy of the petition in the manner provided for service of a summons and complaint by Rule 7004(a) or (b). If service cannot be so made, the court may order that the summons and petition be served by mailing copies to the party’s last known address, and by at least one publication in a manner and form directed by the court. The summons and petition may be served on the party anywhere. Rule 7004(e) and Rule 4(l) F.R.Civ.P. apply when service is made or attempted under this rule. Subdivision (a) of this rule is amended to remove provisions regarding the issuance of a summons for service in certain chapter 15 proceedings. The requirements for notice and service in chapter 15 proceedings are found in Rule 2002(q). (a) Who may Contest Petition. The debtor named in an involuntary petition, or a party in interest to a petition for recognition of a foreign proceeding, may contest the petition. In the case of a petition against a partnership under Rule 1004, a nonpetitioning general partner, or a person who is alleged to be a general partner but denies the allegation, may contest the petition. (f) Corporate Ownership Statement. If the entity responding to the involuntary petition or the petition for recognition of a foreign proceeding is a corporation, the entity shall file with its first appearance, pleading, motion, response, or other request addressed to the court a corporate ownership statement containing the information described in Rule 7007.1. (a) Who may Contest Petition. The debtor or any party in interest may contest a petition for recognition of a foreign proceeding. (b) Objections and Responses; When Presented. Objections and other responses to the petition shall be presented no later than seven days before the date set for the hearing on the petition, unless the court prescribes some other time or manner for responses. (c) Corporate Ownership Statement. If the entity responding to the petition is a corporation, then the entity shall file a corporate ownership statement containing the information described in Rule 7007.1 with its first appearance, pleading, motion, response, or other request addressed to the court. This rule is added to govern responses to petitions for recognition in cross-border cases. It incorporates provisions formerly found in Rule 1011. Subdivision (a) provides that the debtor or a party in interest may contest the petition. Subdivision (b) provides for presentation of responses no later than 7 days before the hearing on the petition, unless the court directs otherwise. Subdivision (c) governs the filing of corporate ownership statements by entities responding to the petition. (q) Notice of Petition for Recognition of Foreign Proceeding and of Court’s Intention to Communicate with Foreign Courts and Foreign Representatives. (1) Notice of Petition for Recognition. After the filing of a petition for recognition of a foreign proceeding, the court shall promptly schedule and hold a hearing on the petition. The clerk, or some other person as the court may direct, shall forthwith give the debtor, all persons or bodies authorized to administer foreign proceedings of the debtor, all entities against whom provisional relief is being sought under § 1519 of the Code, all parties to litigation pending in the United States in which the debtor is a party at the time of the filing of the petition, and such other entities as the court may direct, at least 21 days’ notice by mail of the hearing on the petition for recognition of a foreign proceeding. The notice shall state whether the petition seeks recognition as a foreign main proceeding or foreign nonmain proceeding and shall include the petition and any other document the court may require. If the court consolidates the hearing on the petition with the hearing on a request for provisional relief, the court may set a shorter notice period, with notice to the entities listed in this subdivision. Subdivision (q) is amended to clarify the procedures for giving notice in cross-border proceedings. The amended rule provides, in keeping with Code § 1517(c), for the court to schedule a hearing to be held promptly on the petition for recognition of a foreign proceeding. The amended rule contemplates that a hearing on a request for provisional relief may sometimes overlap substantially with the merits of the petition for recognition. In that case, the court may choose to consolidate the hearing on the request for provisional relief with the hearing on the petition for recognition, see Rules 1018 and 7065, and accordingly shorten the usual 21–day notice period. (a) In General. This rule applies in a chapter 13 case to claims (1) that are (1)secured by a security interest in the debtor’s principal residence, and (2) for which the plan provides that either the trustee or the debtor will make contractual installment paymentsprovided for under § 1322(b)(5) of the Code in the debtor’s plan. Unless the court orders otherwise, the notice requirements of this rule cease to apply when an order terminating or annulling the automatic stay becomes effective with respect to the residence that secures the claim. Subdivision (a) is amended to clarify the applicability of the rule. Its provisions apply whenever a chapter 13 plan provides that contractual payments on the debtor’s home mortgage will be maintained, whether they will be paid by the trustee or directly by the debtor. The reference to § 1322(b)(5) of the Code is deleted to make clear that the rule applies even if there is no prepetition arrearage to be cured. So long as a creditor has a claim that is secured by a security interest in the debtor’s principal residence and the plan provides that contractual payments on the claim will be maintained, the rule applies. Rule 8 F.R.Civ.P. applies in adversary proceedings. The allegation of jurisdiction required by Rule 8(a) shall also contain a reference to the name, number, and chapter of the case under the Code to which the adversary proceeding relates and to the district and division where the case under the Code is pending. In an adversary proceeding before a bankruptcy judgecourt the complaint, counterclaim, cross-claim, or third-party complaint shall contain a statement that the proceeding is core or non core and, if non core that the pleader does or does not consent to entry of final orders or judgment by the bankruptcy judgecourt. The rule is amended to remove the requirement that the pleader state whether the proceeding is core or non-core and to require in all proceedings that the pleader state whether the party does or does not consent to the entry of final orders or judgment by the bankruptcy court. Some proceedings that satisfy the statutory definition of core proceedings, 28 U.S.C. § 157(b)(2) may remain beyond the constitutional power of a bankruptcy judge to adjudicate finally. The amended rule calls for the pleader to make a statement regarding consent, whether or not a proceeding is termed non-core. Rule 7012(b) has been amended to require a similar statement in a responsive pleading. The bankruptcy judge will then determine the appropriate course of proceedings under Rule 7016. (b) Applicability of Rule 12(b)–(i) F.R.Civ.P. Rule 12(b)–(i) F.R.Civ.P. applies in adversary proceedings. A responsive pleading shall admit or deny an allegation that the proceeding is core or non core.—If the response is that the proceeding is non core, itshall include a statement that the party does or does not consent to entry of final orders or judgment by the bankruptcy judgecourt. In non core proceedings final orders and judgments shall not be entered on the bankruptcy judge’s order except with the express consent of the parties. Subdivision (b) is amended to remove the requirement that the pleader state whether the proceeding is core or non-core and to require in all proceedings that the pleader state whether the party does or does not consent to the entry of final orders or judgment by the bankruptcy court. The amended rule also removes the provision requiring express consent before the entry of final orders and judgments in non-core proceedings. Some proceedings that satisfy the statutory definition of core proceedings, 28 U.S.C. § 157(b)(2), may remain beyond the constitutional power of a bankruptcy judge to adjudicate finally. The amended rule calls for the pleader to make a statement regarding consent, whether or not a proceeding is termed non-core. This amendment complements the requirements of amended Rule 7008(a). The bankruptcy judge’s subsequent determination of the appropriate course of proceedings, including whether to enter final orders and judgments or to issue proposed findings of fact and conclusions of law, is a pretrial matter now provided for in amended Rule 7016. This rule is amended to create a new subdivision (b) that provides for the bankruptcy court to enter final orders and judgment issue proposed findings and conclusions, or take some other action in a proceeding. The rule leaves the decision as to the appropriate course of proceedings to the bankruptcy court. The court’s decision will be informed by the parties’ statements, required under Rules 7008(a), 7012(b), and 9027(a) and (e) regarding consent to the entry of final orders and judgment. If the bankruptcy court chooses to issue proposed findings of fact and conclusions of law, Rule 9033 applies. (f) Additional Time After Service by Mail or Under Rule 5(b)(2)(D), (E), or (F) F.R.Civ.P. When there is a right or requirement to act or undertake some proceedings within a prescribed period after servicebeing served and that service is by mail or under Rule 5(b)(2)(D) (leaving with the clerk), (E), or (F) (other means consented to) F.R.Civ.P., three days are added after the prescribed period would otherwise expire under Rule 9006(a). Subdivision (f) is amended to remove service by electronic means under Civil Rule 5(b)(2)(E) from the modes of service that allow three added days to act after being served. Rule 9006(f) and Civil Rule 6(d) contain similar provisions providing additional time for actions after being served by mail or by certain modes of service that are identified by reference to Civil Rule 5(b)(2). Rule 9006(f)—like Civil Rule 6(d)—is amended to remove the reference to service by electronic means under Rule 5(b)(2)(E). The amendment also adds clarifying parentheticals identifying the forms of service under Rule 5(b)(2) for which three days will still be added. Civil Rule 5(b)—made applicable in bankruptcy proceedings by Rules 7005 and 9014(b)—was amended in 2001 to allow service by electronic means with the consent of the person served. Although electronic transmission seemed virtually instantaneous even then, electronic service was included in the modes of service that allow three added days to act after being served. There were concerns that the transmission might be delayed for some time, and particular concerns that incompatible systems might make it difficult or impossible to open attachments. Those concerns have been substantially alleviated by advances in technology and widespread skill in using electronic transmission. A parallel reason for allowing the three added days was that electronic service was authorized only with the consent of the person to be served. Concerns about the reliability of electronic transmission might have led to refusals of consent; the three added days were calculated to alleviate these concerns. Diminution of the concerns that prompted the decision to allow the three added days for electronic transmission is not the only reason for discarding this indulgence. Many rules have been changed to ease the task of computing time by adopting 7–, 14–, 21–, and 28–day periods that allow “day-of-the-week” counting. Adding three days at the end complicated the counting, and increased the occasions for further complication by invoking the provisions that apply when the last day is a Saturday, Sunday, or legal holiday. Eliminating Rule 5(b) subparagraph (2)(E) from the modes of service that allow three added days means that the three added days cannot be retained by consenting to service by electronic means. Consent to electronic service in registering for electronic case filing, for example, does not count as consent to service “by any other means” of delivery under subparagraph (F). Subdivision (f) is also amended to conform to a corresponding amendment of Civil Rule 6(d). The amendment clarifies that only the party that is served by mail or under the specified provisions of Civil Rule 5—and not the party making service—is permitted to add three days to any prescribed period for taking action after service is made. (1) Where Filed; Form and Content. A notice of removal shall be filed with the clerk for the district and division within which is located the state or federal court where the civil action is pending. The notice shall be signed pursuant to Rule 9011 and contain a short and plain statement of the facts which entitle the party filing the notice to remove, contain a statement that upon removal of the claim or cause of action the proceeding is core or non core and, if non core, that the party filing the notice does or does not consent to entry of final orders or judgment by the bankruptcy judgecourt, and be accompanied by a copy of all process and pleadings. (3) Any party who has filed a pleading in connection with the removed claim or cause of action, other than the party filing the notice of removal, shall file a statement admitting or denying any allegation in the notice of removal that upon removal of the claim or cause of action the proceeding is core or non core. If the, statement alleges that the proceeding is non core, it shall state that the party does or does not consent to entry of final orders or judgment by the bankruptcy judgecourt. A statement required by this paragraph shall be signed pursuant to Rule 9011 and shall be filed not later than 14 days after the filing of the notice of removal. Any party who files a statement pursuant to this paragraph shall mail a copy to every other party to the removed claim or cause of action. Subdivisions (a)(1) and (e)(3) are amended to delete the requirement for a statement that the proceeding is core or non-core and to require in all removed, actions a statement that the party does or does not consent to the entry of final orders or judgment by the bankruptcy court. Some proceedings that satisfy the statutory definition of core proceedings, 28 U.S.C. § 157(b)(2) may remain beyond the constitutional power of a bankruptcy judge to adjudicate finally. The amended rule calls for a statement regarding consent at the time of removal whether or not a proceeding is termed non-core. The party filing the notice of removal must include a statement regarding consent in the notice, and the other parties who have filed pleadings must respond in a separate statement filed within 14 days after removal. If a party to the removed claim or cause of action has not filed a pleading prior to removal, however, there is no need to file a separate statement under subdivision (e)(3), because a statement regarding consent must be included in a responsive pleading filed pursuant to Rule 7012(b). Rule 7016 governs the bankruptcy court’s decision whether to hear and determine the proceeding, issue proposed findings of fact and conclusions of law, or take some other action in the proceeding. (a) Service. In non-core proceedings heard pursuant to 28 U.S.C. § 157(c)(1),In a proceeding in which the bankruptcy court has issued the bankruptcy judge shall file proposed findings of fact and conclusions of law,. Tthe clerk shall serve forthwith copies on all parties by mail and note the date of mailing on the docket. The Judicial Conference of the United States has published the 2016 dollar amount changes to the US Bankruptcy Code, as required by 11 USC 104(a). These changes take effect on April 1, 2016 and are effective for three years. The full announcement is below, with a chart of the updated amounts. The official announcement is also available in PDF format. Notice is hereby given that the dollar amounts are increased in the sections in title 11 and title 28, United States Code, as set out in the following chart. These increases do not apply to cases commenced before the effective date of the adjustments, April 1, 2016. 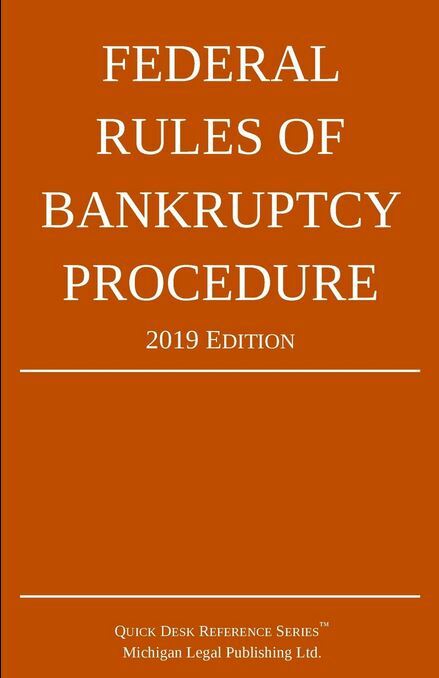 Seven Official Bankruptcy Forms, (106C, 107, 122A-2, 122C-2, 201, 207, and 410) and two Director’s Forms (2000 and 2830), also will be amended to reflect these adjusted dollar amounts. 1 The New (Adjusted) Dollar Amounts reflect a 3.016 percent increase, rounded to the nearest $25. (1)—money judgment of or property worth less than $1,250 $1,300. (2)—a consumer debt less than $18,675 $19,250. (3)—a non consumer debt against a non insider less than $12,475 $12,850. Section 101(3)—definition of assisted person $186,825 $192,450. Section 101(18)—definition of family farmer $4,031,575 (each time it appears) $4,153,150 (each time it appears). Section 101(19A)—definition of family fisherman $1,868,200 (each time it appears) $1,924,550 (each time it appears). Section 101(51D)—definition of small business debtor $2,490,925 (each time it appears) $2,566,050 (each time it appears). $1,149,525 (each time it appears) $1,184,200 (each time it appears). (1)—in paragraph (1) $15,325 $15,775. (2)—in paragraph (2) $15,325 $15,775. (1)—in paragraph (4) $12,475 $12,850. (2)—in paragraph (5)(B)(i) $12,475 $12,850. (3)—in paragraph (6)(B) $6,150 $6,325. (4)—in paragraph (7) $2,775 $2,850. (1)—in paragraph (1) $22,975 $23,675. (2)—in paragraph (2) $3,675 $3,775. (3)—in paragraph (3) $575 $12,250 $600. $12,625. (4)—in paragraph (4) $1,550 $1,600. (5)—in paragraph (5) $1,225 $11,500 $1,250. $11,850. (6)—in paragraph (6) $2,300 $2,375. (7)—in paragraph (8) $12,250 $12,625. (8)—in paragraph (11)(D) $22,975 $23,675. Section 522(f)(3)—exception to lien avoidance under certain state laws $6,225 $6,425. Section 522(f)(4)—items excluded from definition of household goods for lien avoidance purposes $650 (each time it appears) $675 (each time it appears). Section 522(n)—maximum aggregate value of assets in individual retirement accounts exempted $1,245,475 $1,283,025. Section 522(p)—qualified homestead exemption $155,675 $160,375. Section 522(q)—state homestead exemption $155,675 $160,375. (1)—in paragraph (i)(I)—consumer debts for luxury goods or services incurred < 90 days before filing owed to a single creditor in the aggregate $650 $675. (2)—in paragraph (i)(II)—cash advances incurred < 70 days before filing in the aggregate $925 $950. (1)—in paragraph (5)(C)—education IRA funds in the aggregate $6,225 $6,425. (2)—in paragraph (6)(C)—pre-purchased tuition credits in the aggregate $6,225 $6,425. Section 547(c)(9)—preferences, trustee may not avoid a transfer if, in a case filed by a debtor whose debts are not primarily consumer debts, the aggregate value of property is less than $6,225 $6,425. (1)—in paragraph (2)(A)(i)(I) $7,475 $7,700. (2)—in paragraph (2)(A)(i)(II) $12,475 $12,850. (3)—in paragraph (2)(A)(ii)(IV) $1,875 $1,925. (4)—in paragraph (2)(B)(iv)(I) $7,475 $7,700. (5)—in paragraph (2)(B)(iv)(II) $12,475 $12,850. (6)—in paragraph (5)(B) $1,250 $1,300. (7)—in paragraph (6)(C) $675 $700. (8)—in paragraph (7)(A)(iii) $675 $700. Section 1322(d)—contents of chapter 13 plan, monthly income $675 (each time it appears) $700 (each time it appears). Section 1325(b)—chapter 13 confirmation of plan, disposable income $675 (each time it appears) $700 (each time it appears). Section 1326(b)(3)—payments to former chapter 7 trustee $25 $25. posted at least 7 days in advance of the meeting at: http://www.uscourts.gov/rules-policies/records-and-archives-rules-committees/agenda-books. DATES: March 31, 2016 from 9:00 a.m. to 5:00 p.m. The latest amendment to the Federal Rules of Bankruptcy Procedure will go into effect in just a week or so, on December 1, 2015. This year there is only one change being implemented, and that is to Rule 1007. It’s only a slight change in sub-sections (a)(1) and (a)(2) regarding the wording referring to the Official Forms. Previously, the Rule listed the schedules as “D, E, F, G, and H,” but now they’re listed as “D, E/F, G, and H,” which acknowledges that schedules E and F have been merged into Schedule E/F. Subdivisions (a)(1) and (a)(2) of Rule 1007 require the filing at the outset of a case of the names and addresses of all entities included on “Schedules D, E, F, G, and H.” The restyled schedules for individual cases that were published for comment in August 2013 use slightly different designations. Under the new numbering and lettering protocol of the proposed forms, the schedules referred to in Rule 1007(a)(1) and (a)(2) will become Official Forms 106 D, E/F, G, and H—reflecting a combination of what had been separate Schedules E and F into a single Schedule E/F. In order to make Rule 1007(a) consistent with the new form designations, the Advisory Committee voted unanimously at the fall meeting to propose a conforming amendment to subdivision (a)(1) and (a)(2) of that rule. The schedules and other individual forms published in 2013 (other than the means test forms) are proposed to take effect on December 1, 2015—a year later than normal—in order to coincide with the effective date of the restyled non-individual forms. That timeline means that if the Standing Committee approves without publication the conforming amendments to Rule 1007(a)(1) and (a)(2) at this or the June 2014 meeting, the rule amendments will be able to go into effect at the same time as the forms.